When you think of a wedding, there are certain elements that likely pop into your mind: a white dress, a bouquet toss, and the cake. Gone are the days where a simple white sheet cake will do. These days, there are no holds barred when it comes to possibilities - from colors and sparkles to layers and flowers to cupcakes with bridges. Whether you're hoping for something more traditional or a bit more out of the ordinary, you'll probably be soliciting help from a local baker. So if you're in the market for a wedding cake in Indianapolis, look no further! Located in Carmel, Classic Cakes "takes the cake" with its stunning creations. Not only were they at the top of Indy's A-List in 2014, they have earned a reputation for creating the most extraordinary cakes in the Indianapolis area. This all-occasion cake shop features cakes of virtually any shape, size, flavor and filling. And if you somehow can't find what you need, these consummate bakers will attempt practically any cake concept within the laws of physics. The cake creations born here are true originals; all are hand-molded and intricately designed, and feature flavors and fillings that include hazelnut, almond, chocolate truffle, apricot, raspberry and lemon. From cake pops to cupcakes, The Cakehole delights with its moist delicacies. It's unique in that it doesn't have a traditional storefront, but that doesn't hold them back. And they are up for trying most anything - from unique cake flavors like pumpkin, peppermint, and coconut to interesting fillings. According to the Cakehole owner, Jovanna, "You know that cake that you can see in your head but can't find a bakery to create it? Problem solved! The Cakehole has got you covered." Located in Greefield, Two Sisters Cakery and Bakery is dedicated to making your special celebrations more spectacular by providing you with delicious sweets. They offer free consultations for wedding cakes and promise to deliver a product better than you ever could have imagined. Heavenly Sweets make cakes that are just that! Based out of Noblesville, Heavenly Sweets makes its home in the historic R.L. Wilson house. Their cake batter is hand made with mediculous care, and every ingredient is weighed and baked by the owner. Their baking process ensures no over-baked, crusty edges. They claim that their butter cream is "icing on the cake." Heavenly Sweets prides itself on a moist, clean taste that is not overly sweet. Regardless of your budget or your style, these bakeries offer products that you'll want to stare at and sink your teeth into. 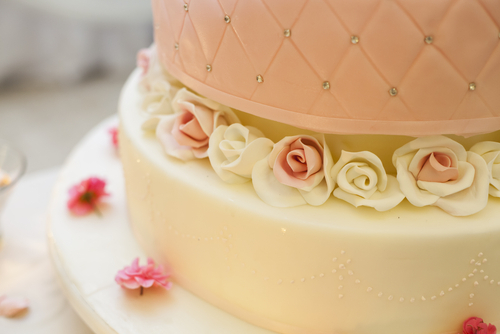 What great wedding cake bakeries did we miss? Leave your thoughts in the comments below!